Top: Hay bales unloaded on an open lot south of Albion Livestock Market, Inc. 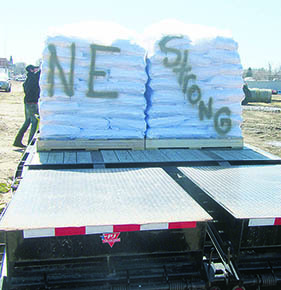 Above: “Nebraska Strong” painted on a load of dried distillers grains to be off-loaded in Albion. Immediate assistance for livestock producers in need of replacement feed due to flood losses is the goal of an effort underway at Albion Livestock Market, Inc. in Albion. Since Tuesday, March 19, an estimated 35 semi loads of hay and other feed needs have been brought in for area producers. Loads have come from Louisiana, Oklahoma, Texas, Kansas, Wyoming, Illinois, Iowa and California, as well as Nebraska, according to Tye Austin, who is coordinating this effort, along with Desirae McLoud of Yankton, SD. More than half of the hay has gone out to area farms and ranches, mostly in Boone and surrounding counties. Some supplies were also rerouted to the Pierce area. The location south of Albion Livestock has also received bales of bedding, some fencing supplies, veterinary supplies and milk replacer. This will be an ongoing effort through this week.